You are here: Home / Featured / So What? The Dynamic of Masonic Membership. So What? The Dynamic of Masonic Membership. The following was originally published in 2007. It is one of several essays in the book Masonic Traveler , where you can find a more refined and extended version of this missive. Since this original publication in 2007, the dialog increased only to taper off again to a quiet whisper, if heard anywhere at all. In 2008/9 Stephen Dafoe produced a rebuttal of sorts, not in the context – but in the meaning of the numbers. His conclusions can be found in the article There’s a Hole in our Bucket, but I recommend that you read it after this piece so as to put all the information into context. So What About the Change in Masonic Membership? The question above has been an institutional answer (yes, I said answer) that has plagued Masonry for the last 50 years. When I first heard it’s asking, I wasn’t sure what to think about it. I wasn’t even sure if I should talk about as it seemed like an internal problem, and not the fodder for the rank and file (you and me) to ponder. It wasn’t until my own realization that it was the rank and file that was ultimately the cause and effect of the question AND answer when its implications became clear. As the adage goes, if you don’t talk about it, how do you fix it? And in such a large fraternity I felt that we absolutely needed to talk about it, NOW. In doing some research, I found myself at the website for the MSANA, which is the Masonic Service Association of North America which is a national clearinghouse for all things Masonic in North America, but specifically an informational collection agency that gathers data and publishes literature for the overall benefit of the craft. One of the items I found there were statistics on membership from 1925 to 2005. The statistics are the national numbers of membership in the United States from 1930-2000 not graphed, but in a pretty uninteresting grid of data. From a surface analysis what it showed was an early high figure, a dip, a huge growth period, and then a dramatic down trend in membership, specifically from a period of 1960 to close to present day. The graph below was created from this data. What it charts is the membership numbers from 1925 to 2005. For a comparison, this graph is the US population in the same period. 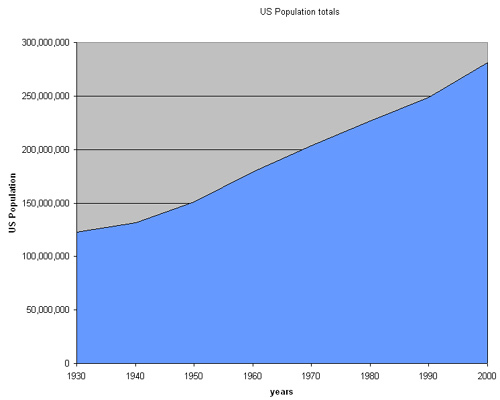 Obviously, the numbers are dramatically different – Freemasonry at one to four million and the US population at 100 to almost 300 million, but what it illustrates by contrast is the dramatic rise in US population (about half of which are male +/- 51/49%) and the dramatic decrease to male membership. 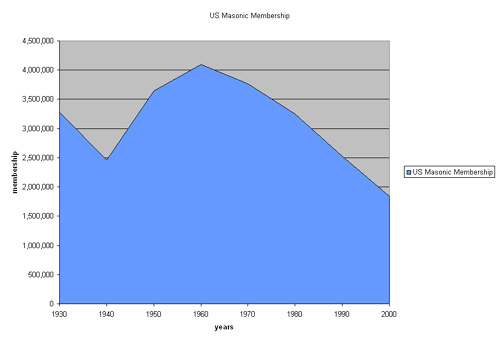 What I want to illustrate here is that while the US population has steadily increased, the population of Freemasonry has steadily decreased, substantially. So to the question, so what? Most who have been members for a significant time know that the membership of Freemasonry is changing. Lodge rooms are seating fewer and fewer members, old buildings bought and built in the boom era are being sold off as membership roles shrink and charters evaporate. We know that already, this isn’t new information. Every Masonic publication has said this at some point or another – “our numbers are retracting, that we felt a boom with the returning vets of WWII and Korea, and that their numbers swelled our ranks to their record numbers, topping at a height of 4,103,161 in 1959” -the glory days of the ancient and honorable. But since that high water mark we have been in a steady decline in membership. Again the question, so what? 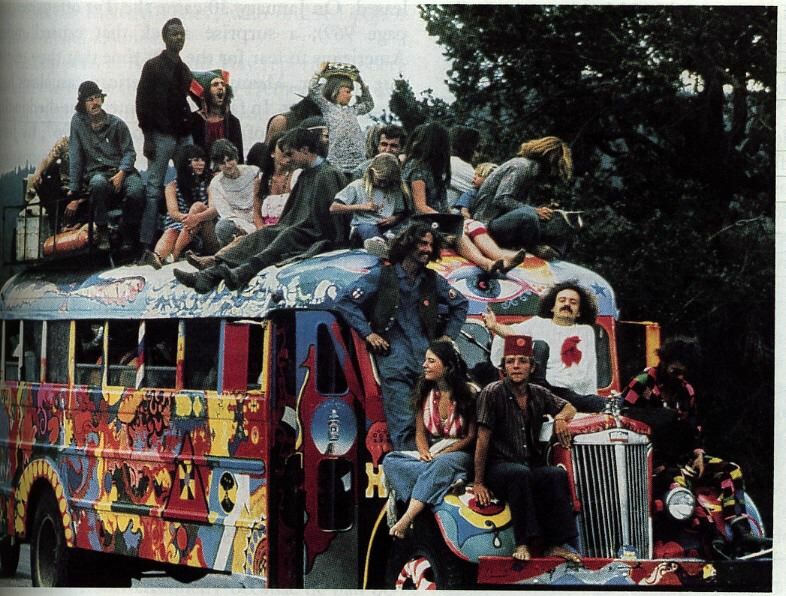 The decline of the 1960’s and 70’s is often blamed on the selfish attitudes of the “tuned out” generation, the hippy turned Baby-Boomer, with widespread distrust of past paternal institutions, and a growth in a personal individuality, no one wanted to join, even when they later came of age the attitude of “Forget doing what Daddy did” and “why do I want to be a part of a secret institution of good old boys” prevailed. But was that really the problem? I’m sure if analyzed in an academic fashion, we could explore the “why Freemasonry changed” notion in the 60’s, 70’s, and 80’s, but I wonder if it would be enough to give us a real answer. Some have suggested it was the institutional change towards fraternalism. Others suggest that it picked up and patriotic flavor of Americanism with the high number of veterans that came to its ranks. Trying to associate the increase to any one reason is difficult at best. What the numbers do tell us is that in 10 year intervals, from 1960 to 2005, membership dropped by an average of 560,152 members. On the graph, you can see the decline to 2005. Distilling the numbers, it comes out to an average of a 20% decrease in membership per 10-year period. Again the question “so what”, we already know this, these numbers are not secret. They are published in an open forum for the public to see. The overall calculation led to an extrapolation, if the fraternity lost on average 560,152 members, per decade – from 2010 to 2020, our national number of members would be under 1 million members at 738,303. In ten more years 2020 to 2030 our national member base would be 178,151. That number again is one hundred and seventy eight thousand one hundred and fifty one TOTAL Freemason’s in North America by 2030, which led me to speculate that the last American Freemason would probably be somewhere in about 2034 or so. Ok, so this is a worst-case scenario, this is an assumption that we will continue to lose the same 560,000 members a year, due to attrition, brothers passing, or low community interest. The overall numbers tell me that the loss % per year is INCREASING; not decreasing, but maybe the trend is just that, a trend. It should be said that at present, 2005 numbers show our fraternity at numbers lower than the 1925 watermark, when the US population was less than half of what it is today. What appears to be happening is not just a “correction”, that it is not simply the Fraternity going back to the “way things were” at the turn of the 20th century, rather that it is something much worse at play and further outside the scope of our control. Taken from another angle, we can say that over the same 50-year period, we did average out to a 20% loss per year. These numbers are far less frightening and show a slower descent over the next one hundred years. In 2030, where the first model takes us to extinction in the percentage model we sit at just over 800,000 members. It isn’t until 2130 that we get to fewer than 100,000. But again, that is at a steady 20% decrease no ups, no downs, steady. The trend in the last 50-year cycle has been one of a steady increase in percentage loss, 8.9%, 13.59%, 22.14%, 27.27%, and 29.47%. This model, though more positive, seems less likely. At the other end of the spectrum, some locations so seem to indicate an upward trend in membership. In areas that lost 4000 members, they took in 2000, diminishing the overall drop, but even these anecdotal statistics only suggest a change in trend without much ability to forecast realistically where the descent will level off. With those of us left, we become the inheritors of Freemasonry here in America, and need to address the question of what we are going to do about it. I have read a Laudable Pursuit as I am sure many other masons have, I attend meetings, pay my dues, and heed the length of my cable tow, but is that enough? Are dynamic meetings, meaningful Masonic education, Traditional Observance Lodges, Festive Boards, or low cost spaghetti or fish fry dinners the answer? Are even the boldest Grand Lodge programs such as the Massachusetts Is there Greatness in you? 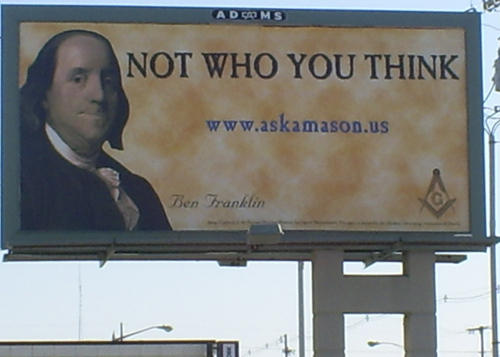 Marketing Campaign or the California Masonic Formation movement, enough? What generated interest in the past? To answer this question we need to ask what Freemasonry has lost — what component of our fraternity did we lose in the transition of the 1950’s into the 1990’s that closed us off from the moral imagination of society? What changed? Was it the success of the offshoot “clubs” whose focus on charity or drama plays, rather than esoteric transference, took prominence? Did we, institutionally, become afraid of what our own metaphysical/spiritual fraternity represented? Were we marginalized as an increasingly religious America took over, forcing out interfaith institution? Did American Freemasonry fall out of progressive step with the evolving landscape of American women’s issues, and racial equality taking the forefront but still at odds in the fraternity dedicated to the moral high ground? It was in the periods of transition from the 19th to the 20th century that many esoteric or occult works were created that seem to evoke the spirit of the coming age of Masonry. Did their promise grow silent on the lips of those who took the reins of leadership? Just a small (yet significant) marker I can point to that symbolically illustrates the transition was the name change of the monthly Scottish Rite Magazine formerly known as the New Age Magazine in 1989. Its true that in the mid century a degree of quackery took hold of the metaphysical giving birth to an explosion of Self Help and “Occult ” practices. Did Masonry’s hasty retreat from all things esoteric help steer the fraternity towards the rocks of fraternal obscurity? Did we become afraid of our own esoteric shadow marginalizing our own traditions effectively doing this to ourselves? The one thing that so many outsiders look to Freemasonry to provide is a degree of esoteric wisdom and education, yet we can barely articulate to the answer to the simple question of “what does Freemasonry represent”? Our tradition is betwixt pointing one way with progressive learning, equality of faiths, and metaphorical death and members pointing another with social fraternalism, overt patriotism, and faux civic engagement – is it a social club or a path to self enlightenment? As the numbers continue to descend, some possible scenarios to consider is the separation of the Shrine from the craft lodge system. With the success that the Shrine has enjoyed in this last century, why would they keep the requirement of the Blue Lodge membership, if the blue lodge can barely support itself let alone its drive for localized charity. Especially now in the face of diminished revenue and potential loss of its charitable hospitals. In its present configuration, can it afford to not take in now blue lodge members? Another scenario is the separation of the Scottish Rite to become its own degree imparting body. What is to keep them from offering the degrees as more Craft lodges start to close? Maybe it makes more sense to pool the resources and go with the bigger temples that the Scottish Rite inhabits. The easy answer is, of course not, but as the feeder blue lodge membership continues to plummet, at what point will desperation take hold and other options become more enticing? Are the American Rites prepared to cease operations if memberships diminish to an unsustainable level? So what? So what can we do about this? The most effectual answer I can come up with, individually, to the “SO WHAT” question is nothing. We can, at this point in time do nothing to turn this trend around. No matter how many open houses, public lectures, marketing campaigns, sports sponsorships, television commercials, radio spots, billboards, or finite programs promoted by individual lodges or Grand Lodges will stem the hemorrhage. Even if the blue lodge started giving away memberships, it’s doubtful that we could find enough people who even remembered who the Freemasons are, and even fewer who would want to become one. The damage is already done, and we are now in a free fall that threatens to erase the remains of North American Freemasonry. This means the closure and roll back of individual state Grand Lodges. This will mean the selling of more Masonic properties and assets, and the selling or divesting publicly of our privately funded billion dollar institutions. This means the end of Freemasonry as we know it today. But all is not lost and that there are things that we , individually, can do now to start to effect change. The greatest challenge will come in our re-shaping the perception of what the fraternity represents and that its history, both real and imagined, becomes a part of who we are. And by understanding that, we can embrace it and celebrate that diversity and begin to explore those ideas that we left off from a century ago. As a body we can pause and consider out institution and how it relates to its broader impact on civil society. Is OUR venerable institution living up to the promises that our very Rites espouse? Do we treat ALL people equally, no matter of Race, Gender, Religion, or Preference? Are we striving to make social progress? In the next 30 years the landscape of what we call Regular Freemasonry will be radically different than what we see today. The sooner we come to see that NOW, to talk about it, and confront it head on – the sooner we can start planning on what we want to do about it. Burying our heads in the sand is not the answer and if we continue to insist on doing nothing about it WE will only further hasten OUR demise. Our generation, RIGHT NOW, is the unwilling inheritor of the future of Freemasonry – what we do NOW dictates how our sons will come to know this ancient institution. If we ignore the problem, there won’t be any institution left. Once you’ve seen them you’ll see that they speak for themselves. Period of 2010 – 2015 15.45%. Period of 2005 – 2015 26.02% (calculated). Doubling the loss from 2010-2015 (424,400) to calculate potential loss = 31% change. New estimate at 2020, 949,093 members. Well done! There has to be some changes, They might be painful for some, but it has to be done. Great article. Great essay, Bro. Greg! However, I’m not as pessimistic as the statistics suggest we should be. It appears the Millenial Generation (and the I Generation succeding it and graduating from high school this year) have essentially the same value system and the same spiritual and self improvement goals. They are looking for meaningful venues that teach the truth which are non-dogmatic. They seem to be curious about the secret society tradition. Our task is to manage the needs of these two generationss together. If we will permit new lodges to be chartered by young men rather than insist they adapt to the culture of our 20th century mindset, I believe a renaissance is possible. I’m not the least bit concerned about a smaller fraternity, as long as it is given the sanction to freely function with a focus on the inner development of the individual. Transmitting the sovereigny of the fraternity back to the individual lodges, and changing the nature of Grand Lodges to become a venue for servant leadership are the keys to positive growth in American Freemasonry. After our fraternity falls another half million men, we should be able to ultimately realize a 3% annual rate of growth. Your essay is a nice wake up call for all of us! Br. Robert, thank you, that means a lot to me from you. Since originally writing it in 07 I’ve had the chance to reexamine some of the ideas in it and while I stick to the projections, I agree that a leaner fraternity will be a tighter and better running fraternity, and like you suggested that point is still about a half a million men away. What seems in flux is the space between here and there, and the unfolding time that gets us there. My grandparents were members of a local lodge, where my grandfather served as a grand mason. The 50’s and 60’s was a time wealth of the common man, and thus could support these kinds of activities which meant growth for these organizations, along with the growth of unions. The protests of the 60’s and 70’s was much to do with the growth of corporations and government, equality and war. If culture or even internal cultures cannot benefit its members and the individual, all will fall. This is the state that has led to the conditions these social organizations, and the populace in general. With only growth seen in those that have time and money to spare, and not the masses. So some temples and lodges has potential to grow among the elite, but continue to shrink in the masses. Promoting the causes of the masses, along with separate AND mixed social activities within (along with the trappings) and outside will grow numbers of temples, lodges, and memberships. The methods of exclusion, practiced by these organizations, and the unions, has led to decline of membership and in society. The losses in the 60’s and 70’s should have been short lived, if the needs of the common man and individual wealth, along with internal growth, had been encouraged. Society can be turned around. Are you up to it? I greatly suggest that you do a study on the countries where the number of Free Masons is continouisly increasing for years al ready. For exemple, you can start with the way the Ancient and Accepted Scottish Rite is being practising in France where it’s very strong. 1) An important fraternity which can be considered as a social club since it practices intensively charity, which working is to know by heart the ritual, and for some of them, the 32th degree ( on a maximum of 33 degrees) is given during one week end to any Master Mason (a brother having reached the 3rd degree) . This Free Masonry is on the decline, with a number of members continuing to decrease over the years. 2) a Free Masonry which can be considered as a fraternity which is searching for a path to self enligthment, which working is based on doing “papers” on spiritual and masonic subjects and for which each degree is to be reached by the ones who have shown by their work that they merit it. This Free Masonry is expanding in number for numerous years already and is continuing its expansion. It can be found in the continental Europe, and in particular in France. 3) a Free Masonry which wants to be on line with this modern era, by accepting women in its ranks, by having discussions in lodge on subjects linked to the real world, i.e. social, political, etc…ones, as members are also considered as citizens of their country , and by being free of any religious believing. This Free Masonry is also expanding in number of members and can be found mostly in the continental Europe. Were you aiming to create some type of awareness or induce a type of panic in the Craft? It’s kinda hard to figure out. No, quite the opposite, to wake up the leadership to the fact of what’s happening and to work more collaboratively at the national level to change the fact of the present course.